Early 1980’s Los Angeles was home to a thriving punk scene that was constantly agitated by the Los Angeles Police Department. This scene, that embraced color, gender, and other differences among its cohort, was inspired to express itself creatively in the midst of a vapid mainstream culture. Nevertheless, these differences that united them were the same that made them targets to an intolerable police force that saw them as societal deviants. Consequently, the shows they put on were either swiftly shutdown or those in attendance were hassled or arrested upon entry and/or exit. In response to this, Stuart Swezey decided to find an alternate venue that would avoid such ridiculous behavior from those dedicated to protect and serve. One where artist and audience could experience something greater than what they were subjected to in the City of Angels. Desolation Center is the story of how Swezey would go on to organize punk and post-punk festivals (in the middle of the desert or on a boat) that not only united the scene, but would go on to influence Lollapalooza, Burning Man, and Coachella. Swezey’s first event, Mojave Exodus, set the tone for the events that would follow. 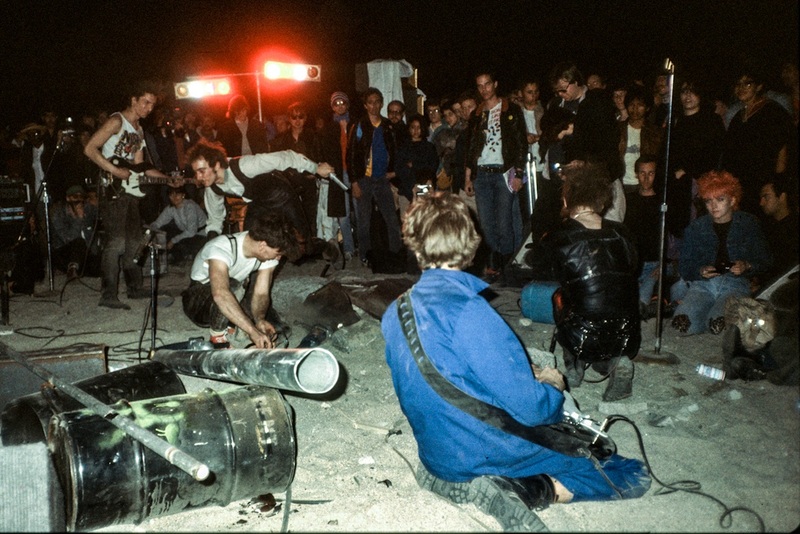 Transporting punk and industrial music fans hundreds of miles via school buses to the furthest reaches of the Mojave Desert, the Mojave Exodus featured punk gods The Minutemen and other local acts using generators to power their gear. Following shows aimed to out-do the previous. But, this wasn’t just an assembly of local LA punks. Swezey would go on to feature German industrial legends Einstürzende Neubauten and New York’s Sonic Youth on subsequent bills, offering genre-busting line-ups that exposed the audience to the cutting edge of alternative music. After conquering the desert, Swezey ask himself what the complete opposite of that environment would be and the Joy at Sea concert was born. Hiring a ferry boat to go out into San Pedro’s industrial harbor, both the Minutemen and Meat Puppets would play as the audience crammed themselves onto the boat and quickly acted to keep the amplifiers from falling overboard. These events were about more than music. Performance artists/inventor Mark Pauline and his Survival Research Laboratories brought their art to the desert. Whether it was the wild machines or explosives, this element of art would find it’s way deeply rooted into Perry Farrell’s vision for Lollapalooza. Bringing this aspect of the LA art-punk world into the events elevated it beyond the confines of a mere rock show. This was a celebration of alternative culture before “alternative culture” was as widely recognized as it is today. That’s one of many reasons why these legendary events have persisted in the memories of those who were in attendance. The film, directed and narrated by Swezey, is full of recently discovered archival footage and photos and is largely told by those who were in attendance and the bands who played. Mike Watt (The Minutemen), Thurston Moore and Lee Ranaldo (Sonic Youth), Blixa Bargeld (Einstürzende Neubauten), Cris and Curt Kirkwood (The Meat Puppets), and Steven and Jeff McDonald (Redd Kross) all appear to recount their memories of playing and attending the events. Equally compelling are the artists, writers, and fans who are on screen describing how these events changed their lives. What’s more, a debt of gratitude must be given to those who attended these shows with the foresight to film them for posterity. This footage is incredible and helps bring the atmosphere of these events to life instead of leaving it to the viewers imagination or relying on the voices of those who attended. Anyone interested in the history of Los Angeles punk rock, or music festivals in general, should watch Desolation Center. If you have zero interest in these topics, the film is a compelling story on its own. It’s a story about how the trappings of Reagan-era society inspired a group of young artists and musicians to create something that was not just for themselves, but an entirely unique experience that existed without parallel.